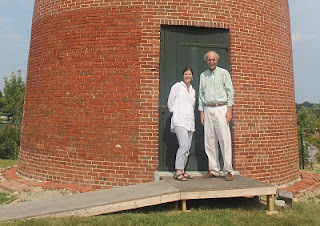 The Newburyport Preservation Trust has partnered with The Boston Architectural College to document Newburyport's 1822 Powder House as the subject of a Historic American Buildings Survey (HABS), with the resulting documentation taking its place among surveys of America's architectural heritage at the U.S. Library of Congress. The Powder House, which has been an ongoing restoration project of the Newburyport Preservation Trust, was selected for the HABS by Robert W. Ogle, Director of Historic Preservation at The Boston Architectural College's School of Design Studies. Throughout the fall semester, BAC students will document the Powder House through measured drawings, photo studies, and historic research reports. Johanna Rowley of the BAC faculty will direct the student team and manage the project. "Preservation through documentation is one of the cornerstones of professional historic preservation practice," said Robert W. Ogle, BAC Director of Historic Preservation. "The HABS documentation process affords students the opportunity to truly learn how to ‘read' a building in context, assess existing conditions, and develop appropriate treatment strategies."